It’s been a while since I updated you all on the projects I’m working on. Sadly, it’s been a bit slow going because of grad school. It will probably continue to be a bit slow going as time progresses. With that in mind, I have to say that I probably won’t do NaNoWriMo this year. Sadly, I will be mired in schoolwork during November, which will make it pretty much impossible to complete NaNoWriMo this year. I have several projects that I’m working on! First, I submitted one of my short stories, 15 000 words, to Less Than Three Press for their anthology call Hearts of Steel. I wrote about knights on an alien planet trying to save someone from the death jungle that covers the entire planet. It was fun to write, less fun to edit, and nerve-wracking to submit. I haven’t yet received a response, but I have to wait a few weeks to hear back from them. I wrote another short for a charity anthology that I was invited to be part of. I’m not sure how secret it is, so I’ll stay hushed about it for now. But it’s 7 000 words long, just a teensy one, so it was finished quite quickly. I have a few different stories on the go right now. I foolishly started an enemy-to-lover story in which the main characters are forced to marry against their will. I think it will be fun to write, but I’ve only got about 8 000 words in. I’ll tell you all how that one goes. I’m also working on doing research for a greenpunk story set in an alternate Victorian London in which green technology became important rather than industry. That’s just the backdrop though, the real story is about a trans woman detective who is trying to catch a serial killer who is murdering prostitutes. This one is a lot more developed than the other one, mostly because I spend a lot of time thinking about it. Murder mysteries are hard to plot out though. This is a hard one to write on, because it’s so complex. I’m working on the sequel to my ace aro dragon story still. It’s also slow going because I seem to have hit a wall, which is probably why I’m working on the other two more than this one. The first book is great, it’s all contained, it sets up everything, but now I’m floundering in the middle. I hope I’ll be able to fix it soon. That’s it for now, I’m deeply mired in numerous projects as well as grad school. Hopefully I’ll get some time to write in between assignments. Anyone working on anything interesting right now? Feel free to comment! 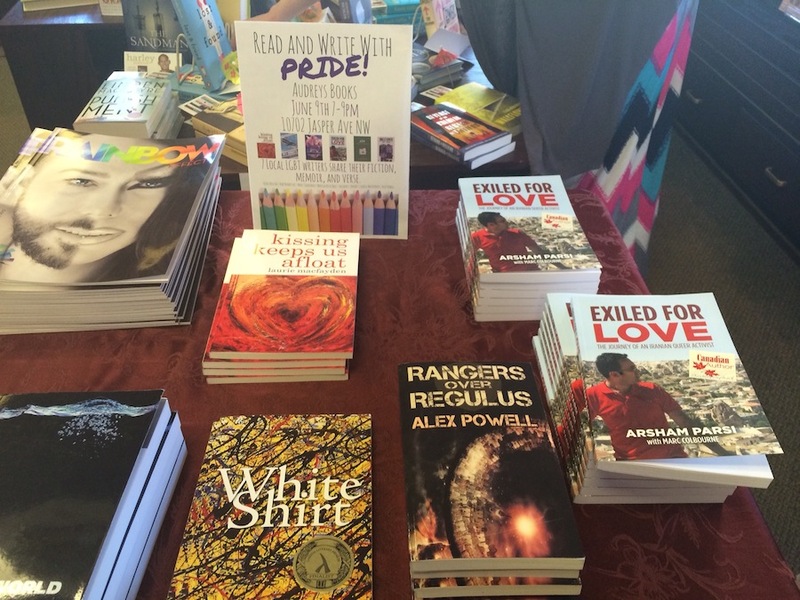 So I want to tell you all about the Read and Write with Pride event that just happened, because I’m so excited about my first reading event. I’ve read things aloud in the past, and I have no issues with public speaking. But I’ve never read my own work to an audience before! It wasn’t as nerve-wracking as I thought it would be. This all started two weeks ago when my friend Heidi Belleau, a very well-known author who writes for Riptide Publishing invited me to this event. Of course, I accepted the invitation immediately. 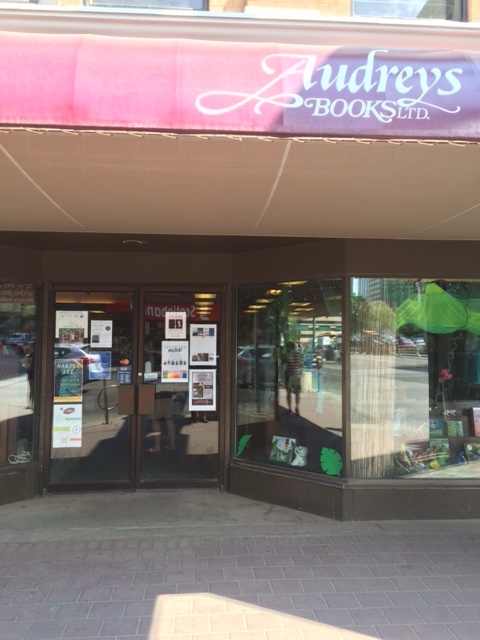 This week was Pride week in Edmonton, hence the Pride reading event. We had quite the array of authors reading, which was great fun. Danielle, our lovely host from Audrey’s Books introduced us all. 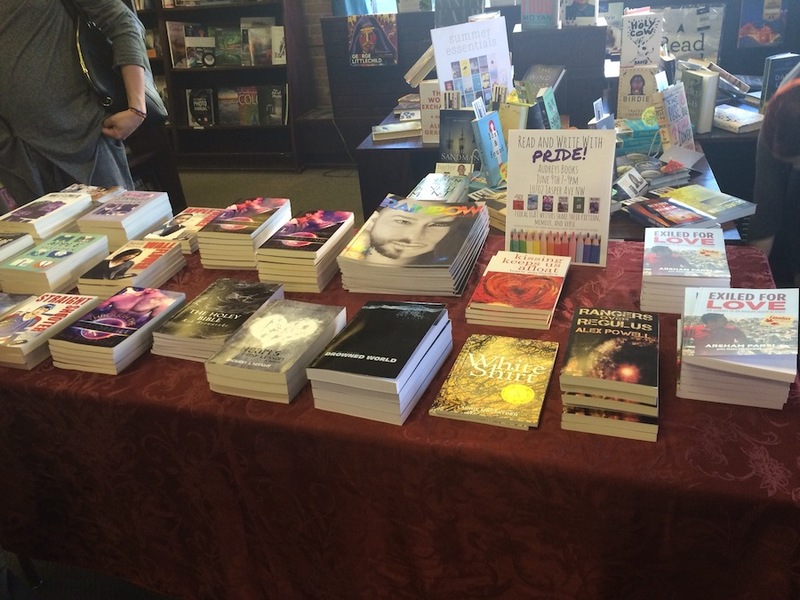 Audrey’s is an awesome little local bookstore, and it has an entire LGBT section! I was really happy to see that. First up was Rob Browatske, a local author who opened us up with a trip down the rabbit hole with the first chapter of his book Wonderland. This excerpt took us deep into the psychedelic gay club scene. I was up next. I read an excerpt from Sky Knights, which is my lesbian fighter pilot novel. I read a fight sequence, which are always my favourite to write, and I have a feeling also my favourite to read. Next was Marc Colbourne, who read from the memoirs of gay Iranian activist Arsham Parsi in Exiled for Love. We were given a real look at how a gay man in Iran comes to terms with his sexuality. We inter-spaced our prose with some poetry. Marina Reid Hale performed some slam poetry for us. My personal favourite was one that didn’t have a title, but was about bisexuality. Next up was Sheldon L’Henaff, who read from his gay fiction piece Joy (Maybe this Christmas), which is a Christmas story that involves drinking, dancing drag queens, and a very naughty Santa. Heidi Belleau, our event organizer, went second to last. She read from Wallflower, which features a genderqueer protagonist! The section that she read from that made me laugh, and most of the audience as well! Lastly, Laurie MacFayden, well-known local poet read us some poetry from her books White Shirt and Kissing Keeps us Afloat. She has some fun, quirky poetry about romance, but I particularly loved the poem “White Shirt,” about picking someone up at a bar. I think our event was a great success, and I’d love to do another reading like this anytime! What is it? It’s a project in which I give my book Rangers over Regulus to one person that I know, and they will read it and pass it on. Sounds simple, right? It really is, it’s a project with no real parameters except curiosity. Where will my book end up? If you’re looking at this message, one of your friends has given you this book to read. This book is starting out with one person, and that person is going to read this book and pass it on. I want to see where this book ends up. Call it an experiment of sorts. I’d like to try to keep track of it, so if you receive this book and feel like updating where it is and who you are, just send me a message, maybe a picture of where it has ended up this time. 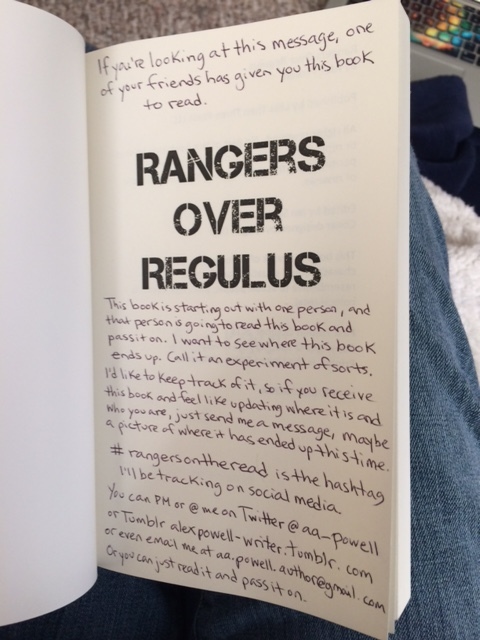 #rangersontheread is the hashtag I’ll be tracking on social media. Or you can just read and pass it on. Seems pretty straight forward, right? Just read it, send me a message if you like, and pass it on to the next person. I want to see where the book ends up. I’ve decided that I’ll start with just one book for now, and I’m starting it in Prince George, BC, Canada, which is my hometown. In case any of you readers are wondering where the heck that is, I’ll tell you. 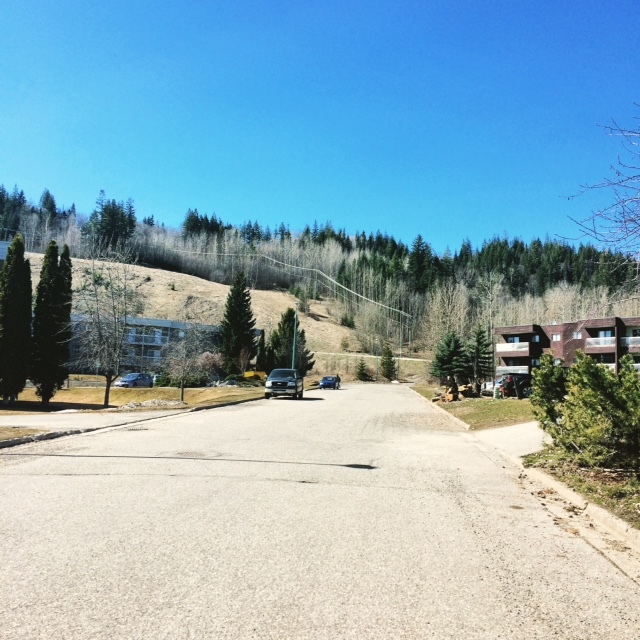 Prince George is a town of about 72 000 people in the middle of the Caribou Central Interior of British Columbia. It’s near the west coast of Canada, and is the largest city in northern BC. It’s an hour flight to Vancouver or Edmonton, and a ten hour drive by car. Two major highways run through PG, one running east to west and another running north to south. 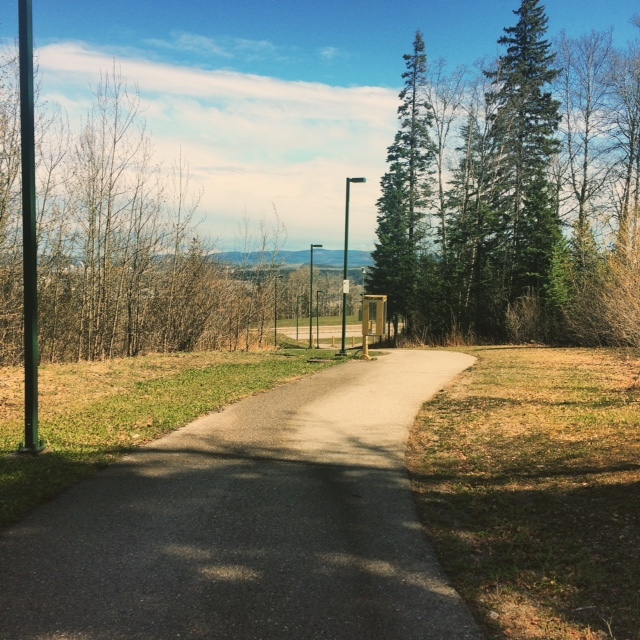 We have a small university, the University of Northern British Columbia (not to be mistaken with UBC, which is far less awesome). If I had to take a guess where the book is going to end up, I’d say probably the university. But I can’t say that I’d be surprised if it ended up anywhere else. My book might just circulate around Prince George for awhile and then end up in a garbage somewhere, missing its cover. Or it might end up on the other side of the world. I guess we’ll wait and see. I might try this again with my starting point in Vancouver later, if this turns out to be a success. Thanks everyone, I’ll keep you updated on its progress. I’ve gotten a bit behind on my writing projects of late, which makes me a bit sad. 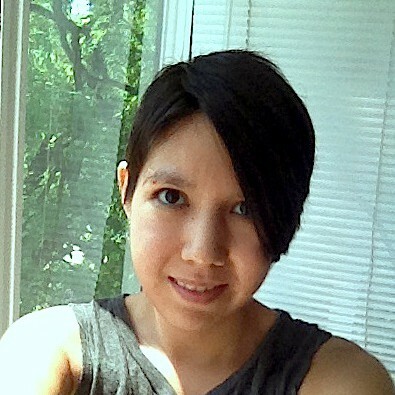 Apart from being a writer, I’m also a student trying to get into Grad School. That’s going well for the moment, so I’m returning to writing projects I need to get done. I’ve included a couple of pictures of my hometown in the post, just so you have an idea of what type of place I’m writing in. My cyberpunk novel is actually finished being written, revised, and beta-read! It took almost forever, and right now I’m on the editing stage. As you know, I find editing tedious but necessary to the final project. The novel is at 58K words right now, and I will be submitting it as soon as I finish my editing rounds. As I’ve discovered, I really like putting unnecessary words like “started to” and “began to” at the beginning of sentences and have to take them out. It is time-consuming, but I’m hoping to be done editing by mid-May. My ace dragon story is already outlined at over 40k words, and these types of things have a tendency to get away from me. So I’m guessing that it will probably end up around 50-60k words by the time I finish. As I’m hoping to get a lot of writing done this summer, I’m hoping to have the writing bit finished by the end of July. I keep saying I’m going to write for collection and anthology calls, but the things I write end up being longer than expected. So I’m going to try and fit in a short story for the Bisexual anthology call Enchanted Soles with Less Than Three Press. I find short stories the most difficult to write, so hopefully I won’t get carried away! As usual, I have plot bunnies running around breeding profusely inside my head as well as projects I put on the back burner. I’ll try and stick to my guns and get everything finished. Summer writing projects are fun. Two summers ago, I was in Vancouver, and I managed to finish off Hakusan Angel while writing in posh cafes. Prince George is slightly less posh, but hopefully, that won’t curtail the writing flow! This is my new page for all my social media contacts. Come and hang out with me!